(without the killing) drew mclellan, edgeofmyseat.com If you're here expecting to hear something about superheros, then you're in the wrong place. Andy Clarke's presentation is in the other room. Otherwise, you're here because you're prepared to say in a loud clear voice to the world that you think content management is more interesting than superheros! Well, actually I don't think content management is more interesting than superheros, but I know it does have more impact on my day to day life, and therefore it's an important topic if a slightly dull one. I'll be charitable and assume that's why you are all here too. o hai! Hello, I'm Drew Mclellan, you may remember be from web sites such as allinthehead.com, web development agencies such as edgeofmyseat.com, and grass root coalitions such as The Web Standards Project. edgeofmyseat.com a specialist web development agency experienced in building web applications from content management systems, e-commerce applications, to the systems that run your business. so, content management then. Whilst you probably thought you were coming to @media to listen to a bunch of gu ! from pencil-twiddling designers, the reality is that there's some really boring aspects of our work that we have to know about. Stu ! that enables all the creative stu ! to sing. If we're helping clients to communicate their content through good design - we can't escape the fact that behind the design is this mass of content, and like it or not (usually not) this has to be managed in some way. Your content management system may be the work experience guy going around and pestering people for copy and collating it in a folder on his desk. That's content management, with a vague manual system. As soon as you have two or more items of content, you need some kind of system (automatic or manual) to control where it goes on a site. As the volume of content grows, a manual system can become overwhelmed and hit its limits very quickly. Manual systems often have pysical limitations - be that the reliance on having access to materials (that perhaps are locked in someone's desk drawer whilst their out for the day), or just relying on one person who's holding the entire thing in their head whilst having increasing demands placed on their time. Manual systems of content management can work (and did work for decades in professional publishing). We're not professional publishers, however. Your clients are not professional publishers (usually). They have their own business to run. Very quickly an automated system of content management is required. http://flickr.com/photos/neilw/138493599/ Eggs. I don't know how you like your eggs cooked. Prince Charles apparently has seven boiled eggs in a sliding scale of varying hardness cooked for him each morning, enabling to pick his egg based on his mood that day. I don't know if you've ever tried poaching an egg using the swirling water technique... you swirl the water in the pan until a vortex is created in the middle and then drop the egg into that. With a bit of luck the water is su " ciently hot to poach the egg before the vortex subsides and egg gets sprayed around the pan. I've tried it, and I can't do it. When needing to do something with greater e " ciency or predictability in results, human beings look to build tools that will save labour and help in the process or doing whatever we're trying to get done. a tool for preparing eggs should be as simple as possible, but no simpler. Eggbert Einstein Just as we look for tools to help with e " ciency, reliability of results and to save labour, as a race we also tend to by instinct over-complicate things whenever we can. It's clear to see that Caractacus Potts got rather too carried away with his egg-preparing machine, and as a result probably cost more labour in constructing, operating and maintaining than the simple task of cooking some eggs each day would have cost in the first place. Plus, when something goes wrong, the cause isn’t always immediately obvious. “A boiled egg makes an almost perfect breakfast . It's the most nutritional breakfast money can buy. The downside is that it's a bit of a hassle to prepare. James Seddon Seddon's device, which he goes on to describe as "a bit like a toaster for eggs" and presumably can be used to cook dairy products day after day without ever needing to be cleaned (!!) again takes a very simple process and introduces lots of clever - albeit unnecessary - technology to attempt to further simplify it. Often with disastrous results.
" So what's this got to do with content management? Well, I don't think the parallels I'm trying to draw here are hard to see. When looking for a system to help manage content, often people will think of everything they can imagine a content management system might do, draw it up as a list, and then submit that list as a set of requirements for the system they are looking to install. They specify a Caractacus Potts machine when often all that's needed is a pan, some water and an egg timer. as simple as possible, but no simpler. This often leads to over-investment in a solution and therefore creates political ties to a system which can outlast the usefulness of the technology. 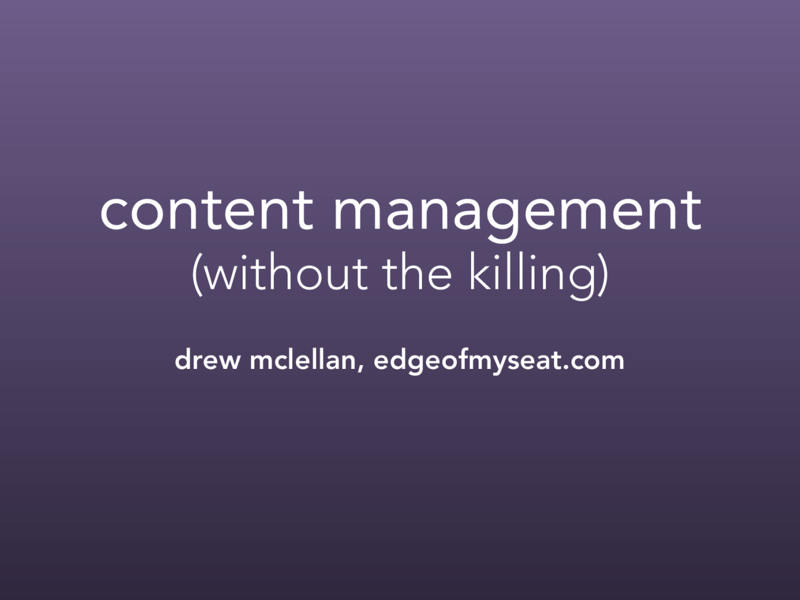 What I'm talking about today is Content Management Without the Killing - how we can go about making sure any content management we build or put in place for a client is going to meet their needs without any unnecessary bloodshed. say when. When Do I Need Content Management? - There are typically two key scenarios that indicate a web site may have a need for some sort of content management system. The first is when you find the person who's responsible for your site sat in the carpark each morning, weeping because they can't admit that another work day has begun. The first, rather obviously, is the case whereby a site simply has a lot of content that is turning over on a regular basis. These could be news items, articles or blog posts, press releases or whatever. Content may need to be repurposed in the format of RSS feeds or in cross-site summaries or promotions, or published in multiple languages. Even with a skilled workforce, keeping all that content organised manually is a monotonous task at best, at worst expensive, odious and unfulfilling. It's precisely the sort of job that computers are good at, so it makes sense to give it to one. Consider content management duties a computers punishment for making us deal with printers. so controlling. you’re not the boss of me The second case where content management becomes key is when you need to take more control over the editing process. the editing process needs to be stepped back from the simplest system of someone editing web pages directly. This is usually either because the content editor doesn't have the required skills to work directly with HTML, or because direct access to the content needs to be managed for the purposes of rights, versioning or scheduling. you don’t understand my needs that’s all I’m saying A mistake people often make is thinking that because part of a site needs some kind of content management system in place, that the entire site has to be placed under content management. They have some frequently updated news items being posted to the front page, would like to o ! er the option of customers subscribing to those items with RSS, and so draw the conclusion that a content management system is required for running the site. That, or they think that because they need part of their site content managed now then it's likely that in the future they'll want more and more of the site under control of content management, as so specify a system that can cover the whole shooting match. This falls into into a common trap - that we'll be looking at more later - of specifying a system today based on the perceived needs of tomorrow. you’re not my type . There are all sorts of di ! erent types of content management system, of course, each with their own purpose. ine version of the site, and then having that tool upload all the touched files to the web server. This comes into its own for large static sites. Whilst this may seem to limit your options in terms of o ! ering alternative representations of content (RSS, for example) it actually needn't. Just because you're generating static pages doesn't mean you can't have multiple representations, content reuse and so on - your tool just has to support that. What something like Dreamweaver and Contribute won't give you, however, is the ability to publish to schedules, easily manage multiple languages and show di ! erent content to di ! erent users and lose all those dynamic features that are almost par for the course with a modern site. However, for certain types of content this can still be a good option. online management Far more common in the content management arena are the familiar online CMSs. In this instance the CMS is a web application that basically runs your site. A request comes in for a page, gets passed to the CMS and it's that system's job to decide what content, templates and so on to show. Editing of content is typically performed through web-based forms, and stored in some kind of database. This is what we typically think of when we talk about a web based content managemnt system. And they come in many di ! erent guises. Whether custom build or o ! -the-shelf, or even somewhere in between, online content mnagament systems can generally be divided into two distinct and very important camps. a generic system wouldn't necessarily have the tools in place to enable you to do that. You may get somewhere close to what you need by misappropriating categories or tags, or using second-class 'additional data' fields, but as a rule, if you have unusual data a generic tool won't necessarily be perfect for representing it out of the box. your site , your way. So if you're not using a generic system designed for building any site, then the flip side is using a system designed specifically for your site. This may consist of an existing system customised and extended for publishing your content in the way that you need to publish it. Obviously if it's a system tailored to your specific needs then the chance of there being limitations that need working around is dramatically reduced. You should be able to publish your data in whatever formats you need to, without any restrictions. it’s not you, it’s me. If there's two important things I've learned about content management over the years it's that a) everyone hates their cms - and that's because chosing and implementiing a content management system is hard to get right. b) The good news is that no CMS is forever. Needs change over time, often in ways that you cannot anticipate. Attempting to find an implement a solution that works for today's needs and will continue to meet a set of future unknown needs is almost impossible. common features. COMMON FEATURES There are a lot of features that are common to most content management systems - or at least should be common even if not. /shiny/happy/ urls One of the key features to look for when evaluating a CMS is its ability to publish content with clean URLs. Not only because you want to be publishing content with nice clean URLs, but because this tends to betray the manufacturers underlying understanding of how the web works. Being able to write software and having a good grasp of how the web works are two di ! erent skills. All too often you find that content management systems - even big commercial ones - can be written by teams with an understanding of the former, yet not the latter. As a result, CMSs all fall into one of three categories a) CMSs that can't deliver content with clean URLs b) CMSs that can't but wish they could - some technical decision made in the past is holding them back, and c) CMSs that can produce nice clear URLs as an option from the get-go. Why is this important? data feeds RSS and Atom. user generated content (cringe) Things start becoming more complicated when a content managment system has to start dealing with content coming from two directions. Generally content is created by the people running the site, is input via an admin interface and is output to the users at the front end. As soon as you start accepting User Generated Content - that is information submitted by the users of the site - be that comments, reviews or what have you. The system then needs to manage this information, commonly along with some kind of user accounts, enable moderation of content by administrators, and so on. Once you're dealing with user accounts and user data, you have to provide a mechanism for users to manage their account, and their data. Including the ability to remove themselves and their data from the site should they choose to do so. You have to keep in mind the possible future expansion - if you have users sign up today to be able to add reviews, if you add discussion or support forums in the future are you going to be able to support that using the same user accounts? off the shelf systems There are hundreds, if not thousands of di ! erent content management systems in the marketplace, and so would couldn't possibly begin to go into the pros and cons of each one here. Review site cmsmatrix.org currently holds data on 915 di ! erent content management systems that can be compared and contrasted, from free systems up to those costing hundreds of thousands of pounds. And as they vary in price, the systems also vary in scale. weblog management systems Right down at the bottom we have the simple content management systems designed for management blogs. You'll often hear people state that these aren't 'proper' content management systems or aren't content management systems at all. That's nonsense. They're just specialist tools designed for managing content in a particular way. In 2006 webstandards.org looked like this. It was a collection of static HTML pages fronted by a blog running on Movable Type. lessons learned • dynamic rendering is a lot more expensive • the ‘pages’ feature was immature and slow ‘Pages’ page takes 21 seconds plus to render. enterprise level content management So-called 'enterprise level' content management systems typically come in at around the cost of a shiny German executive car and require consultancy and training that can come in at the cost of a shiny executive yacht. building our business on top of someone else’s Intellectual Property Might be ok for something for ourselves, but not as a solution to give to a client. avoid per-user licensing you’re probably being ripped off avoid per-user licensing - often a sign that you're being ripped o ! . View Content Management Without The Killing on Notist. @drewm is talking a lot of sense about content management. Listen to the audio when it is released if you are considering a CMS.